The new MOJO magazine, out Tuesday 19th March, celebrates every era of Fleetwood Mac. Heralding their hotly anticipated homecoming shows, MOJO embraces all of Fleetwood Mac’s stellar phases, celebrating their 50 Greatest Songs while interrogating Mick and Christine about their latest incarnation... and why Lindsey had to go. A 15-track covermount CD mines priceless nuggets of Detroit soul – including The Temptations, The Miracles and Jackie Wilson – while inside the mag we relive the hard-scrabble birth of the storied Motown label. Plus! 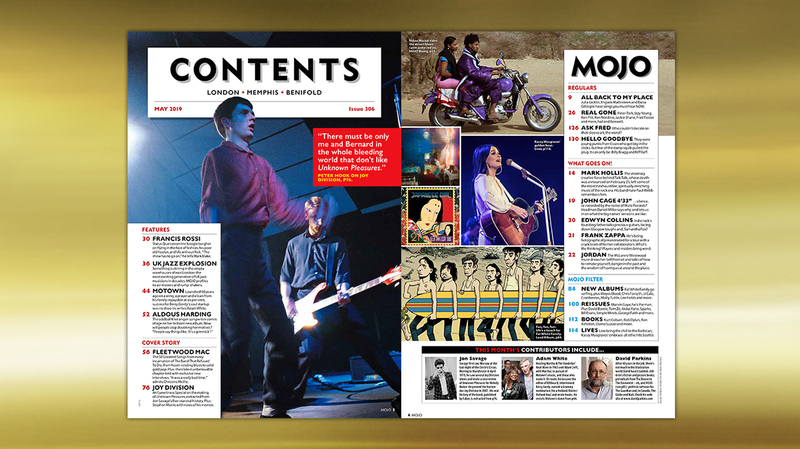 The oral history of Joy Division’s Unknown Pleasures; Status Quo’s Francis Rossi ’fesses up; a tribute to Talk Talk’s hermit genius, Mark Hollis; the explosion of new British jazz; and an introduction to the extraordinary kiwi singer-songwriter Aldous Harding. And! We run the rule over unmissable new releases by Marvin Gaye, Fat White Family, David Bowie, JJ Cale, Weyes Blood, Lee Fields, Chris Forsyth and zillions more.